Montreux is the most frequented resort on Lake Geneva and famous for its beautiful lakeside location in the southwestern part of Switzerland. Enhanced by a spectacular background of the Alps, the town of 26,000 inhabitants has charmed many people in the past. Montreux’s Mediterranean climate has given this city a reputation as being one of the noblest resort destinations in Switzerland. 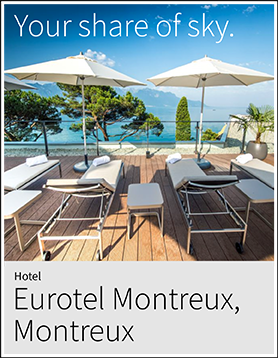 Book your Montreux, Switzerland vacation today! The city of Montreux stretches along the shore of Lake Geneva and rises in elevated tiers covered with Mediterranean trees and vineyards. The city’s bay location faces south, sheltering it from north and east winds. Aside from its historical architecture, picturesque lakeside views, and exclusive stores, Montreux also hosts internationally known cultural events. Since 1967, the city has hosted its annual Montreux Jazz Festival in which the world’s most talented jazz, blues, and rock musicians are featured. Given Montreux’s exceptionally mild climate, there is a variety of Mediterranean plant species that grow along the lake. This region of Montreux is therefore often referred to as the Vaud Riviera. The unique combination of lakeside palm trees and mountainous landscape gives visitors a true feeling of paradise. The beautiful scenery and exotic vegetation is best explored on the Quays of Montreux, a 13 km/8 mi footpath which borders Lake Geneva. The city of Montreux is not only charming because of its character but also its surroundings of Lavaux’s terraced vineyards and beautiful countryside. Located in the heart of Western Switzerland, Montreux has become an ideal starting point when exploring other places of interest. 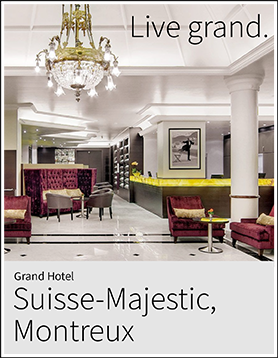 Among some of the near destinations include Geneva, Lausanne, Vevey, Gruyeres, Gstaad, and Zermatt. 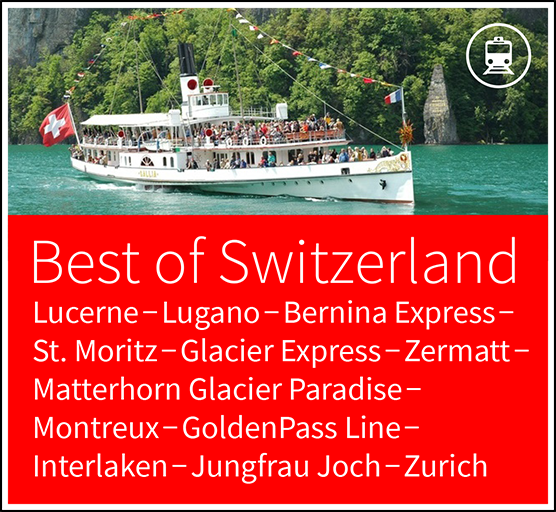 There are numerous local trains that depart Montreux and bring travelers to these nearby cities and their summits. Panoramic views of both the Swiss and French Alps are even obtainable within Montreux with a visit to Rochers-de-Naye. 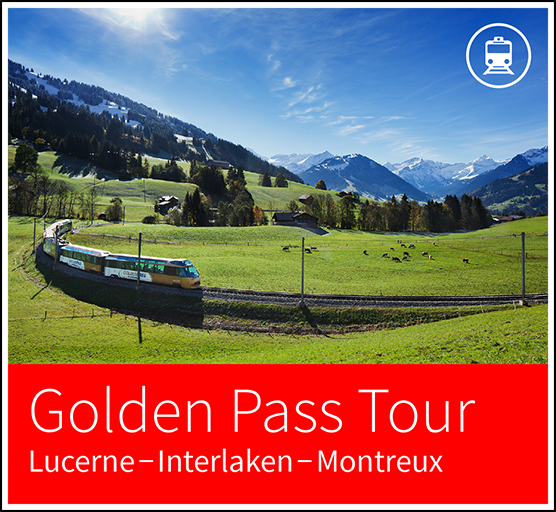 Enjoy remarkable views of the area by taking the Golden Pass panoramic train between Montreux and Interlaken, a fantastic addition to any vacation. The Chateau de Chillon is located in a unique setting of Lake Geneva’s shoreline and has become the most visited historic building of Switzerland. As the residency and profitable toll station of the Counts of Savoy, the Chateau de Chillon was inhabited for nearly four centuries through the middle Ages. Visit Chateau de Chillon from Montreux by boat, or even on foot to explore its 14th century paintings, subterranean vaults and well-maintained courtyards. St-Saphorin is a typical wine village found in the terraced vineyards of the Lavaux region. Visit its village cellars for a taste of famous local wines such as St-Saphorin or Epesses while taking part in an old tradition of this area. This picturesque wine growing village dates back to Roman times, making it an historical site for the production of wine. The quaint medieval village of Gruyeres is located north of Montreux with train duration of 1 hour and 30 minutes. The village’s museum can be found inside Gruyeres 13th century castle and exhibits 800 years of regional history, architecture, and culture. Also be sure to check out Gruyere’s Cheese Factory to enjoy free samples while learning about its origin and production process. Visiting Gruyeres can be made into a full or half day excursion and is a great supplement to your Montreux, Switzerland vacation. Rochers-de-Naye can be visited year-round with a railway that brings guests to an elevation of 2042 m/6699 ft for spectacular views of Mont Eiger, Mont Blanc, and Lake Geneva. The cog railway descends from Montreux station to Glion, Caux and further to the summit. Visit Rochers-de-Naye for the opportunity to hike, enjoy breathless panoramic views, explore marmot colonies, and even the Grotttes de Naye caves. Taking the Train de Vignes is an excellent way to enjoy Montreux’s beautiful surroundings, specifically the terraced vineyards of Lavaux. The route stretches 8 km/5 mi beginning at Vevey Station and ending in Puidoux-Chexbres. Explore Lavaux as a UNESCO World Heritage Site by embarking on this leisurely train ride and exposing yourself to breathtaking views of the Savoy and Valais Alps. There are many gorgeous cities located short train rides from Montreux. Visiting these locations can add a new element to your Montreux, Switzerland vacation! As one of Switzerland’s best-kept secrets, Lausanne is located only 30 minutes from Montreux via train. It is the next largest city on Lake Geneva and well renowned for its sports and culture with the Olympic Committee Headquarters. Geneva is located a 90-minute train ride east of Montreux and is home to 200 international organizations. Geneva has many international highlights including the European United Nations Office and Red Cross Committee. Similar to Montreux, Geneva is French-speaking and lies in a Lake Geneva bay. 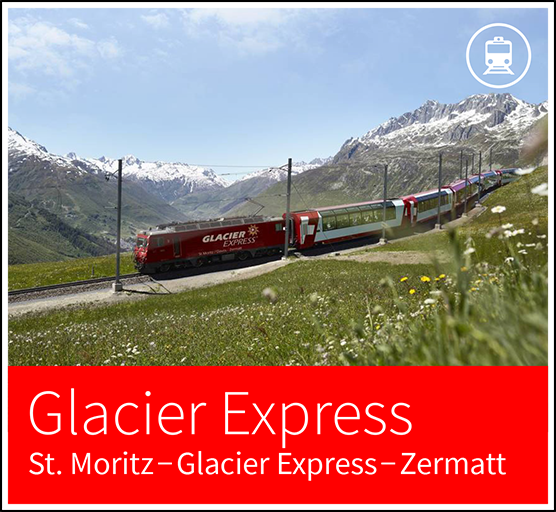 As a popular full day excursion from Montreux, visit the typical mountain village of Zermatt elevated at 1620 m/5310 ft The 2-hour train ride travels along the sunny southern flank of the Lötschberg Mountain and provides a great first impression of the Valais. The route to Zermatt staggers through the beautiful valley landscape and eventually leads to the Matterhorn Mountain. 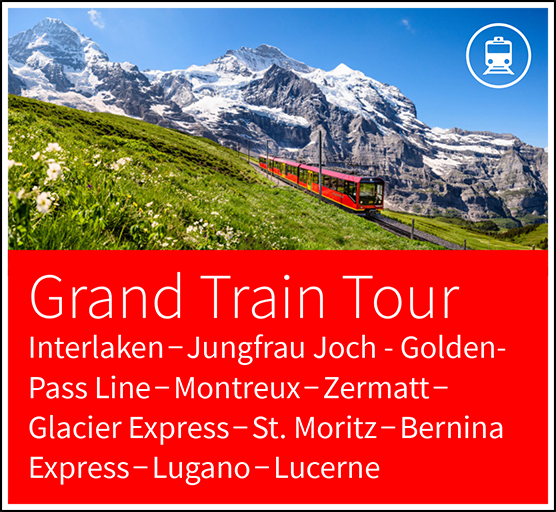 Extend this excursion by taking a cogwheel railway up to the 3089 m/10134 ft Gornergrat peak. Visiting the village of Gstaad is another popular full day excursion as it is located 2 hours and 30 minutes east of Montreux via train. As a popular holiday region in the Bernese Oberland, Gstaad attracts a variety of international and local visitors. Its neighboring countryside of Saanenland is an athlete’s paradise with plenty of mountain sports available as well as cross-country skiing in the summer months. Montreux is ideally located for visitors to enjoy leisure hiking paths with a relatively flat terrain along Lake Geneva. One popular route begins in Montreux and ends in Le Bouveret while passing through Villeneuve. This hike brings walkers by the Chillon Castle and into the Rhone delta’s nature conservation area. Check out the local tourist office for free brochures and detailed hiking maps. You may even find some guides to show you the way on your Montreux, Switzerland vacation. Lake Geneva’s crystal clear water is safe to swim in and can be accessed at several public swimming areas. Montreux’s city center also features an Olympic size pool for those that prefer to swim in a pool. There are two attractive ski areas accessible from Monteux by train, car or bus. One resort is called Rougemont-Chateau-d’Oex-Gstaad and the other Villars-Gryon-Diablerets-Leysin-Les Mosses. The Lake Geneva region is also known for its cross country skiing options in Le Sentier, Les mosses, and Sainte-Croix- Les Rasses. This casino is located on the shores of Lake Geneva and invites guests to enjoy 10,000 of nightly entertainment. The Casino offers three restaurants, two bars, terraces, 24 gaming tables, 377 slot machines, a poker room and even a swimming pool. Enjoy a creative cuisine and excellent service next to luxurious surroundings and panoramic views of the lake and Alps. Montreux provides its visitors with a great shopping experience with stores offering the latest products from Paris and Milan. There are also several vendors that feature the finest Swiss made watches and army knives. This museum is located in Montreux’s old quarter with installations in homes previously inhabited by winegrowers. The museum’s setting presents a lively representation of the local region’s history. Visit the Montreux History Museum to learn more about the origins of Montreux’s culture and traditions. The oldest railway museum is located only 15 minutes from Montreux in the town of Blonay. As the largest collection in Switzerland, the museum exhibits a variety of over 60 different historic vehicles. Visitors are given the opportunity to travel in one of the most well-maintained steam locomotives. The museum invites guests to explore its pristine collection ranging from steam tramways to electric streetcars. This museum is fun, engaging, and a great addition to any Montreux, Switzerland vacation. Visit the Olympic Museum in Lausanne to experience the extraordinary timeline of Olympic sports from their antiquity to today. This museum uses the latest computer technology and audiovisual media to display the Olympic spirit of the world’s most famous athletes. With it’s beautiful location on Lake Geneva, the Olympic Museum is easily accessible from Montreux by train with an hour in duration. Montreux is located in the southwestern part of Switzerland on Lake Geneva. The city’s nearest airport is situated in Geneva, 96 km/60 mi away, and can be reached by car or train in 1 hour. Travelling to Montreux from Geneva is very accessible with several trains departing the airport every hour. Montreux is 209 km/130 mi from Zurich and 88 km/55 mi from Berne. Contact our Montreux, Switzerland Vacation Guides to Plan Your Custom Switzerland Itinerary!